One of the first questions we ask in any of our studies is the age of the participant. The purpose of this is two-fold: first, age can be an important variable, predicting a number of physical, psychological, and social outcomes. Second, due to ethical restrictions, the IARP is unable to study minors (as parental consent would be required, something we cannot reasonably expect to obtain if a person has not “come out” to their family as a furry). As the table above and figure below shows, furries tend to be relatively young, with the majority of adult furries (over the age of 18) being in their early-to-mid-twenties, and nearly 75% of furries being under the age of 25. 1 Convention-going furries tend to be, on average, a bit older than furries in our online samples. This, we believe, is due to the fact that conventions can be expensive to attend (e.g., travel costs, hotel), requiring a level of expendable income and long-distance transportation more available to those with stable careers, who are more likely to be in their mid-twenties than their late teens and early twenties. a. On average, it took greymuzzles much longer to discover the furry fandom after developing furry interests (9.5 years vs. 4.6 years), likely a product of internet accessibility. b. Greymuzzles are 3-4 times more likely to self-identify as therian. The IARP is currently investigating the reason for a significant drop in the age of furries, particularly after the early 20s. One possibility is that, as people age, factors such as families and careers may reduce the amount of time people can devote to their hobbies. Alternatively, it may be the case that as furries spend time in the furry fandom, they form close friendships and, after a while, find themselves interacting with those friends outside of furry contexts. 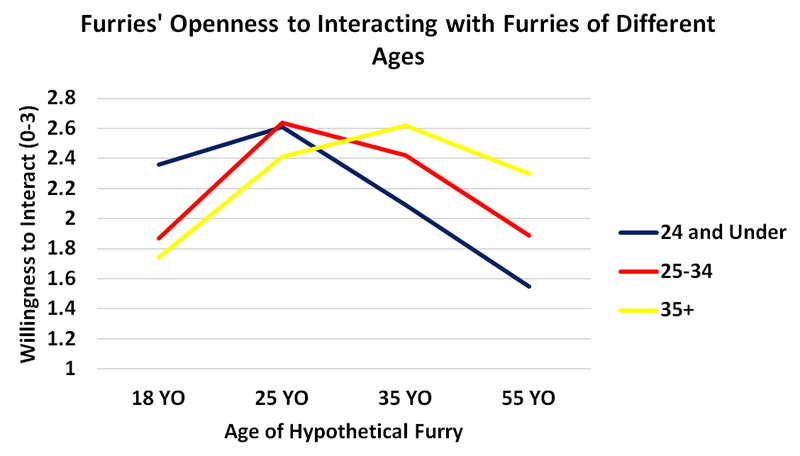 On average, furries are older than anime fans (both convention-going and online), but younger than fantasy sport fans.4 Whether this is due to the fandoms targeting different age groups, requiring different amounts of resources to enter (e.g., money to spend on fantasy sport leagues), or other factors remains a topic of interest for future research. 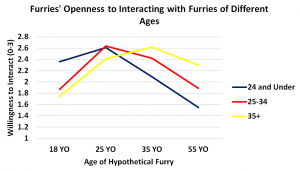 In 2017 the IARP began studying how age affects interactions between and attitudes toward members of the fandom, particularly whether members of the furry fandom tended to hold positive or negative attitudes toward furries outside their age group7.